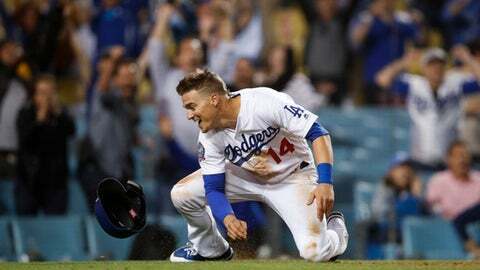 LOS ANGELES (AP) First, there was a violent play at the plate that led to two ejections and a benches-clearing incident. Then the game was won on a play at the plate with an unusual tag. Austin Barnes followed with a comebacker, and Bush reached out to grab it. But Bush hurried as he spun around, and his throw home for a potential forceout pulled catcher Carlos Perez off the plate. Hernandez stepped over Barnes’ bat, pirouetted around the catcher and touched home with his right hand, leaving Perez tagging nothing but air. ”Just bringing back my Latino roots, showing off my salsa moves,” Hernandez joked. The Rangers asked for a replay review, and the safe call was upheld. After Barnes’ at-bat, the Dodgers would’ve run out of position players – instead, Bush’s error sent Texas to its season-worst sixth straight loss. The last-place Rangers got swept for the third time this season and second straight series. Kemp barreled into Chirinos with his arms up, leading with his shoulder. Chirinos’ helmet flew off as he got knocked over and Kemp fell, too. Chirinos held onto the ball for the out. Crew chief Bill Welke said Kemp didn’t violate the rule, and both players were ejected for their tussle after the play. The Dodgers led 1-0 in the first on Justin Turner’s homer. They added a run in the second on a double steal by Puig and Forsythe. Puig scored from third. Hamels allowed two runs – one earned – and five hits in six innings. He struck out six and walked four. Turner’s homer was the 18th given up by Hamels this season.